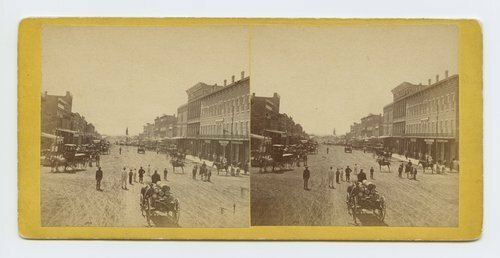 This stereograph shows Massachusetts Street, Lawrence, Kansas. Visible in the photograph are business buildings, different forms of transportation, and people and a wagon on the street. It is from Alexander Gardner's series, Across the Continent on the Union Pacific Railway, Eastern Division. Massachusetts Street, Lawrence, Kansas. 323 miles west of St. Louis, Mo.